Rate this Article Bingo games are pretty much a dime a dozen on the massive virtual space we call the internet, but there are a few that stand out from the rest. Wizard Bingo happens to be one of them. Why? Well, let’s find out! Bingo games are pretty much a dime a dozen on the massive virtual space we call the internet, but there are a few that stand out from the rest. Wizard Bingo happens to be one of them. Why? Well, let’s find out! One of the first things that Wizard Bingo offers is the option to play the game with stars or with real cash. Depending on your mood and whether or not you think Lady Luck’s on your side, you can easily switch between playing the game for real money, or to simply enjoy a couple rounds of bingo without the pressure that playing with real money will bring. Of course, if you’re the sort who enjoy the thrill of having real money on the line, you’ll be glad to know that one of the best features of Wizard Bingo or for any of Star Games’ (the game developing company behind Wizard Bingo) many games on their website is that they allow quite a plethora of banking methods. From the common Visa, Maestro and MasterCard, you can also use bank wire or transfers, PaySafeCard and Neteller to make a deposit or to withdraw your winnings. Best yet, there’s no service fees whatsoever! On the other hand, if you just want to play the game casually, well, you’re in for a treat! Wizard Bingo not only has a very low wager requirement – only a minimum buy-in of 6 stars per card, though if you prefer, you could buy up to 4 bingo cards in total. You could even shuffle the numbers on your bingo cards to your liking for free prior to starting the game. Need more stars? Star Games has some nice promotions for you as well. With a few Euros, you can top up your stars and enjoy playing Wizard Bingo once again. What if something happened to your internet and you are disconnected from the game? Well, in Wizard Bingo, you’re treated fairly... more so than any other betting games on the internet, I dare say. If that happens, all payments and plays are voided and you’ll get back the money or stars that you’ve used to buy into the game. The most amazing part in Wizard Bingo though is its extensive pay table. Unlike most bingo games out there where players are only awarded when they get any one of the 4 traditional patterns (Horizontal line, vertical line, diagonal line, and bingo), you can get awarded for some really unique patterns like the Flag or the Double T or even the Pyramid in Wizard Bingo. There are 12 patterns in total, and naturally, different patterns will reward you with different amounts of payouts with the Bingo pattern taking the crown of the lot – the jackpot of over a hundred thousand in cash. 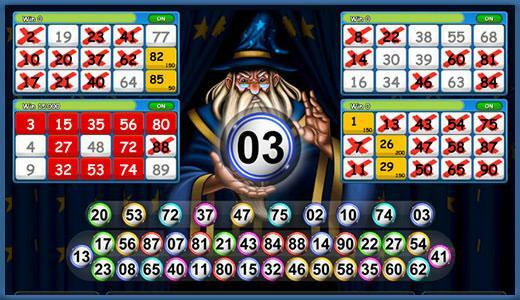 Due to the huge variety of patterns, Wizard Bingo has a very unique and helpful indicator system. Numbers that are colored in red are numbers that have already been used to form a combination while numbers that are highlighted in yellow are part of a pattern that is almost complete. This color-based system is particularly useful for players to easily keep track of the numbers as they are revealed by the bingo balls. Wizard Bingo also has plenty of other features that make it unique. For instance, do you know that you can buy extra bingo balls after the first round to increase your chances of getting a particularly profitable pattern? Or that you could speed up the rate at which the bingo balls are revealed? All of these features, no matter how insignificant they may seem at first, are crucial in enhancing your gaming experience, giving you one of the best online bingo experience the internet has to offer! So, let’s revisit the question - Why you should play Wizard Bingo? Well, Wizard Bingo is not only very entertaining to play, it also gives you a pretty unique bingo experience – bordering on “truly magical” – that will delight bingo fans from all around the world. If you haven’t tried the game before, now’s your chance! Play Wizard Bingo today!